Manannan’s Cloak brings together a range of texts in the Gaelic language of the Isle of Man from the earliest writings to the present day, along with their English translations. Written Manx arrived comparatively late, and the size of the Island’s population was not conducive to the widespread development of Manx literature. Nevertheless, the amount of Manx literature collected here may come as a surprise. The texts in Manx are linked by a narrative which places them in the context of Manx history, and includes observations about the language and the people who used it by a number of officials and visitors to the Island, such as George Borrow. In recent years there has been a positive attitude to the language which has led to the development of a modern literature in which books are published professionally to meet a growing demand. Manx is taught as an optional subject in both primary and secondary schools. There is a primary school, Bunscoill Ghaelgagh, where Manx is the medium of education. Four subjects are also being taught through Manx at secondary level in one of the Island’s schools. The Isle of Man is a small, ancient kingdom in the middle of the Irish Sea. The regalities of the Island were purchased by the British Crown in 1765 (an event known in the Island as Yn Chialg Vooar – ‘The Big Swindle’!) The Island’s political constitution means that it is not part of the United Kingdom and is only an associate member of the European Union. A linguistic study has also referred to ‘the extraordinary independence of Manx’. Robert Corteen Carswell, born in 1950, was introduced to the Manx language at an early age in written form (Edmund Goodwin’s ‘First Lessons In Manx’ and a copy of ‘Conaant Noa’, the New Testament in a second edition published in 1775). His interest in all aspects of the Isle of Man has led him to a Masters degree in Manx Studies, and he has been dancer, musician and (occasional) singer as well as song-writer, author and teacher of Manx language and dance. He has been involved in broadcasting in Manx since the 1970s, taking the opportunity to present little-known aspects of Manx history and folklore and place them not only in a Manx context, but also in a wider context that looks outwards to celebrate the Island’s place in the world. With his first wife, Peg, he researched, revised and devised stories and rhymes for the Manx-language playgroup that Peg led, before she became one of the peripatetic teachers taking Manx into the schools. They have three sons, Eben, Conal and Gilno. He is now married to Linda, who was born and brought up in Cornwall. Manannan’s cloak is of invisibility, and is traditionally provided by the mists that swirl round Ellan Vannin, the Isle of Man. 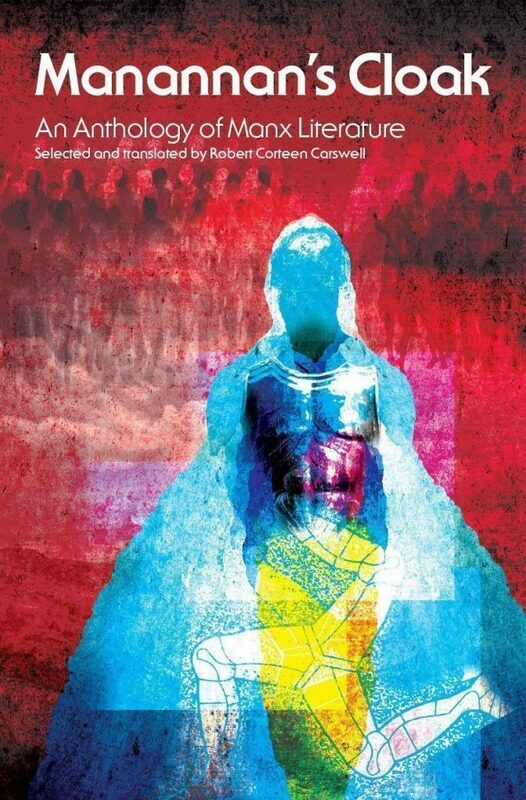 This doughty work of selection – which is also a mighty labour of love, since the anthologist has translated over 100 pages of Manx into as many pages of English – will actually do more to celebrate Manx than shroud it in more secrecy. It dispels the mists, revealing something of the reality of life as lived in Man these past five centuries. One’s own language gives a distinct flavour to literature, and not all of that is lost in the (very necessary) translation. The earliest records of a Celtic language in Man date from ca 600, and include the proper name MaqLeog “Son of the physician”, which is still around as the popular surname Clague (and even Clegg!) The texts selected begin ca 1500, with the beginning of the “Traditionary Ballad” – Coontey Jeh Ellan Vannin Ayns Arrane, which is more literally translated as “Account of the Isle of Man in a Song”; the start is all about St Patrick, and how he brought the blessings of Christianity to the island in place of the “heathen” (Anchristee) god Mannanan (sic: we learn early than the Manx – or more traditionally Manks – people prefer to stress the first syllable). itself: but the context makes it clear that affection for the language has not been universal on the island. Life becomes a bit more prosaic after 1950: the proportion of verse falls, but reportage, journalism and novels (notably murder mysteries) all make an appearance. The publishing future looks full, and unpredictable. The result, for the Manx-less reader, is a rapid course in the history and the distinctive world-view of the Manxman and Manxwoman (including a “Carval of Bad Women”), as well as a rapid practical introduction to the language: since all the text is translated line for line, those who know English and some form of Gaelic will find it fairly easy to pick out the language in its distinctive Angloid dressing. This book is a very fitting Manx member of Francis Boutle’s sequence of anthologies of literature in the minority languages of Europe. We English are at last being shown some of the delights which have been going on beneath our raised noses for many centuries, and in a form which, while instructive to those of us who rely on a lingua franca, is also true to these peoples’ own words.